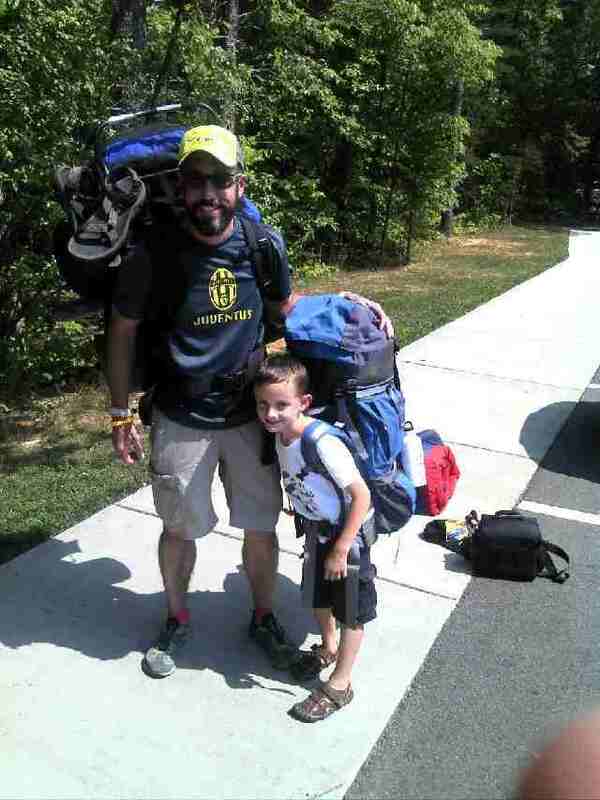 I left Friday afternoon for Winston Salem shortly after posting my last blog entry. Once I arrived in town I quickly drove around the hotel and familiarized myself with my staging point or home base for the weekend. I checked in a bit early thanks to my wife’s platinum status with the hotel chain and left for the packet pick-up to ensure I not only got what I needed but also had time to eat a decent dinner and digest it before the wee hours of the morning when I would have to wake up. I had already surveyed the area for nearby eateries, wanting to eat early so as not to cause any stoma related issues come race time but thought I might pick up the packet right at 4 o’clock and grab something there. I was mistaken. 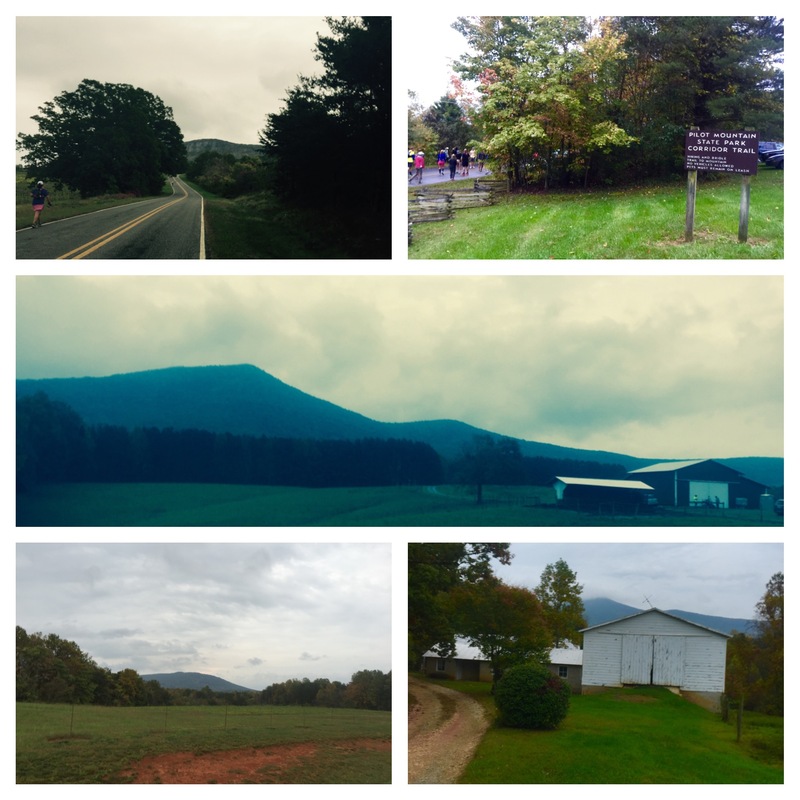 The winding roads through the North Carolina foothills were reminiscent of where I grew up in Western North Carolina, scattered with farms, antiques, and old country homes. There was a familiar feel to the area. When I spotted a mountain top in the distance I murmured to myself, “There are mountains out here”. I headed back to the hotel immediately after I collected my packet and drop bag. I stopped by the Whole Foods across the street and scarfed down a couple of extra large slices of pizza with kombucha tea, then grabbed a cookie and coffee to go so that I good begin race day preparations. 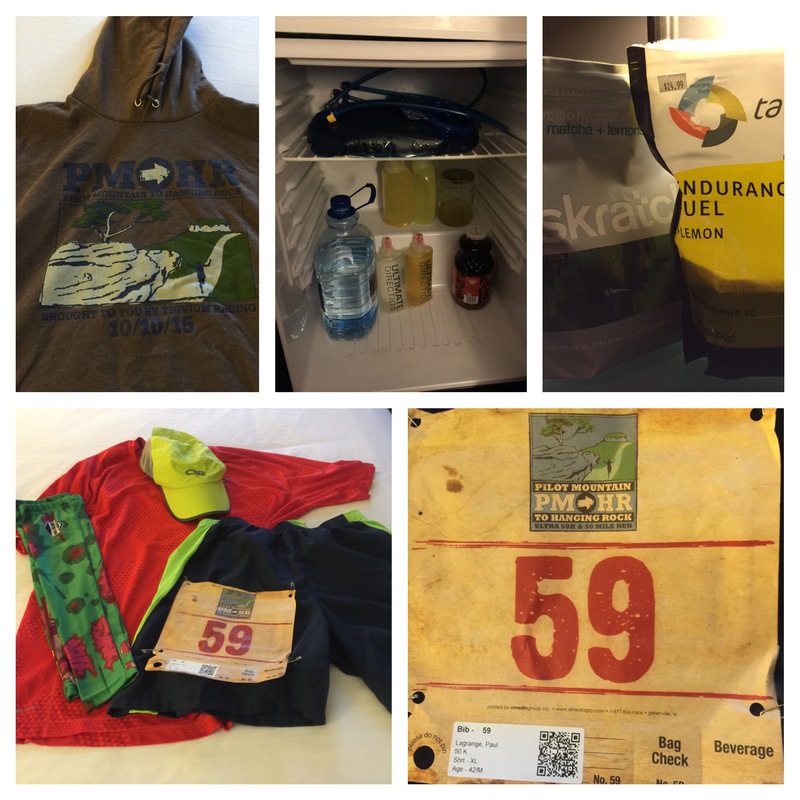 When I got back to the room it was time to start mixing hydration mixes into camel bak bladders, pouring peppered pickle juice into my handhelds, and laying out my clothes and gear for the morning. The surface area of the bathroom counter littered with water bottles and bags of skratch and tailwind resembled a lab. The weather forecast on race day called for cooler temperatures with highs not expected to get much above 60 and an 80 percent chance of rain. The rain had already begun shortly after I returned to my room. My biggest dilemma in laying out the gear was hat or bandana. I typically go full pirate on my runs as I have found that buffs, bandana, and skull caps are better sweat collectors than even the best running hat and do a better job keeping the sweat out of my eyes. Would that be the case if it rained during the ultra? I reached out to the best group in the world Ostomy Lifestyle Athletes for advice on the matter. In the end I decided to start with the hat but bring the skull cap just in case. So I packed all my items that I may need in ziploc bags due to the forecast including an emergency bag change. My camelbak vest often does double duty as its not only a hydration bladder but backpack too capable of carrying more supplies than one would imagine and as it turns out was even necessary. However I like to prepare for the worst and hope for the best. The night before any race is difficult to sleep, the night before your first ultra is even more so. Despite the fact that my alarm was set for three forty-five a.m. I was up throughout the night. The ostomy never helps in that respect. Up extremely early I took a shower to wake up and put on a new appliance. Once I dressed and gathered my things I was out the door and on my way to Danbury, NC where I would have to take a shuttle from the Green Heron Club to the start of the race. When I arrived it was still very early, almost 5 am. It was very muddy from the rain the night before and a light rain continued to fall. Volunteers in headlamps were out at the club early directing traffic into the parking lot. The 50 milers had arrived some time ago to catch their shuttle to their starting line and already departed. 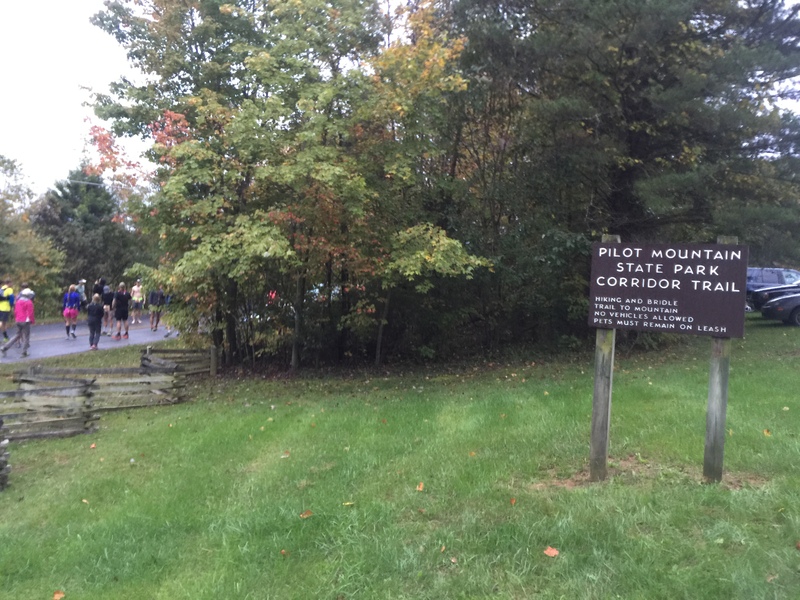 The shuttle for the 50k runners, which was initially scheduled to depart at 6:30 did not arrive until 7 a.m. and departed shortly thereafter. I met an ultra runner from Southern California while sitting on the steps of the Green Heron and waiting for the shuttle and we chatted a bit in route to the starting line. I was particularly curious to hear about her take on trail running out west after having visited the ITT (Indian Truck Trail) earlier in the year. It was pretty quiet at the start of the race and the occasional rain drop I believe had most runners apprehensive about facing a miserable mudfest. While excited about the race I wasn’t as nervous as I am for most road races perhaps because of the distance and having no expectations or idea on how to run the race. When the gun sounded we were off and I was feeling good. The weather was perfect. The temperature early in the morning was actually in the mid to upper sixties and as fair as rain was concerned, it was a mist at best. The trails were gorgeous and it was really easy to get lost in their beauty. For the first few minutes I had in the back of my mind that this would be a piece of cake. The trails so far were groomed, the weather was ideal, and it was beautiful. I was going to hit my stride and not look back. Then a little over a half mile into the race I pulled up lame. I had done something to my calf muscle. I could not even put weight down on my right foot. Limping along the trail on my left foot while grasping my right leg and wincing, I pulled my cell phone out of my vest pocket and called my wife to share the news. This was the worst. I was done for and the 31 mile/50 kilometer race had not even started. With her words, “Don’t hurt yourself anymore than you already have”, I said goodbye and hung up the phone, switching back to airplane mode to preserve battery life. I started off front of the pack to start the race but as I hopped along the trail on one leg fielding questions and expressions of concern from my fellow runners I in no time had slipped to the back of the pack and questioned whether I could proceed for thirty plus miles. One thing I knew for sure is that I wasn’t a quitter and I had put to much in to this endeavor to give up so early. It took me a while but I continued to tell myself that I had to push through the pain. Fortunately my focus on proper running form helped as I concentrated on running on the balls of my feet and not extending my stride very much. While I typically don’t over stride my new gait was shortened more than normal. By picking my legs up and running on the balls of my feet I was able to minimize the pressure on my calf. In a relatively short amount of time I had developed a rhythm I believed could carry me through the race. It was painful, no doubt. My right calf felt as if someone was stabbing a knife into the lower calf muscle. The trail conditions did not help either. A few miles into the race there was a small stream crossing along a very slick wooden bridge, missing boards and all. With the first advancement of my right leg I slipped and fell backwards catching myself with my hands holding firmly to the rope rails as I fell back inches from the ground. I popped right up but not without aggravation to the injured leg. At the next stream crossing I attempted to hop from rock to rock to avoid getting wet and ultimately made matters worse and still got wet. Lesson number one from my first ultra, “Don’t sweat getting wet”. Around the same time I had discovered I would be able to push through the pain I realized it really wasn’t raining that hard and the Outdoor Research running cap I started the race in wasn’t collecting sweat and was slipping from around my head. On the run I shoved it into the back of my camelbak pack and whipped out my tie-dye skull cap which was a much better solution and what I wanted to wear the entire time. The first half of the race was rolling hills, farm land, and horse pastures, which made my injury tolerable as the course was not too daunting. I seemed to be making up ground passing several of those that had passed me at the onset, though not nearly in the same numbers. I came across the woman I met at the Green Heron and helped her avoid a course miscue by pointing out a wrong turn. Around mile 8 I reached a farm and the race took a turn down a long gravel road. I was in some significant pain and wanted badly to switch out my leg for a new one. Stopped in the port-a-john to empty my bag, just because it was there, not long after having emptied it on the trail. There was still 23 miles or so to go. As my forward progress took me further I knew I needed to get calories and protein to sustain me throughout the race. In the weeks leading up to the race I had become wary of the solid food I had attempted to experiment with earlier in the cylcle in large due to the recent development of another parastomal hernia. Thus, I resigned to the fact ahead of time that I would attempt to subsist on gels and chews along with my calorie and electrolyte enhanced concoctions I carried with me in the camelbak. My mind had plenty to think about during the race so at no point did I lack for mental engagement. I attempted to refocus the pain I was experiencing in on the beauty of the course, the weather, nutrition, and ensuring I did not take a wrong turn or step. The creek crossings were numerous and each time my feet got soaked. As the day progressed the water became colder and colder. With the first water crossing I swore I would have to change shoes as soon as I got to the drop bag site, mid-way through the course. However just a few minutes of running past each creek crossing and I had already reconsidered. As I approached the mid-way point, around mile 12 I had drained my 2L camelbak bladder as well as two handhelds and whatever I collected at the last aid station. 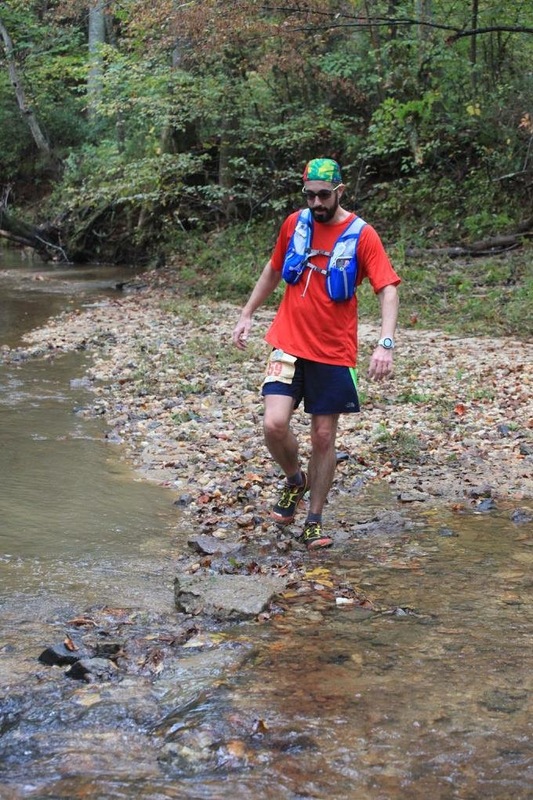 The next several miles without fluids for an ultra runner/ostomate were murder. When I reached the midway point and drop bag location it was a relief. I opened my drop bag almost immediately and pulled out my second bladder. That bladder was a godsend. I also grabbed the ultra aspire reusable cup and filled it twenty times over to quench my thirst right away. After exchanging bladders and refilling the collapsable handhelds I sat down on the asphalt and changed my cold soaked socks. It was at that time that a slew of runners made their way to the aid station and I realized whatever lead I had gained after falling back early was now lost. 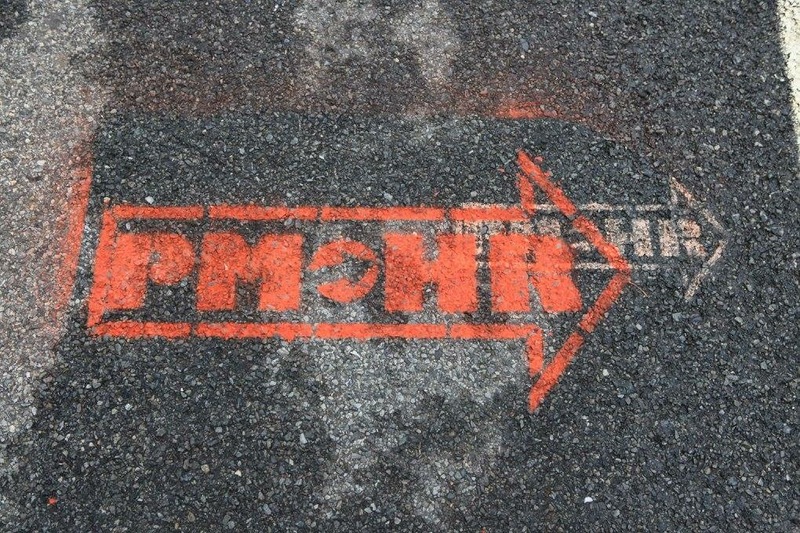 It was also at the halfway point that the race would only begin. 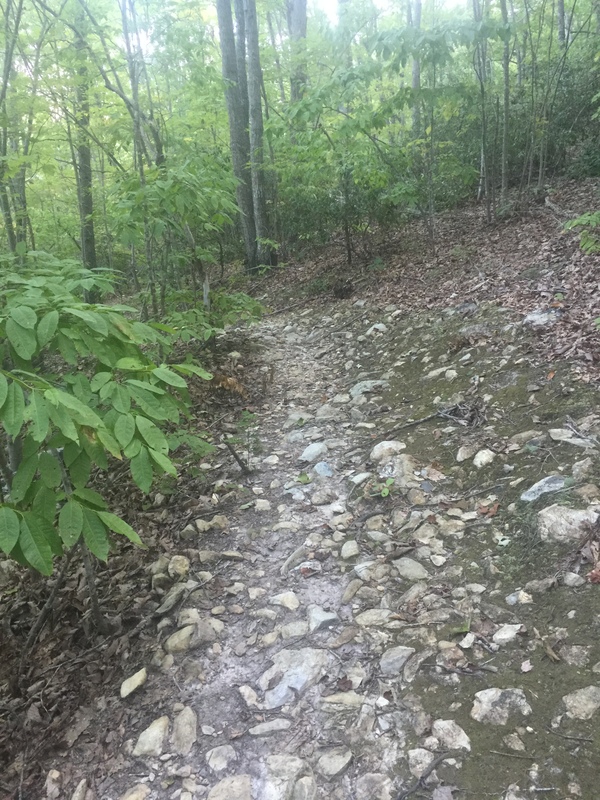 Shortly after leaving the aid station with a twinge of pain in my leg and considerable stiffness I raised myself from the ground and proceeded along a long dirt and gravel road. It was at the midpoint of the race that I reconnected with my morning acquaintance from the front steps of the Green Heron. With about 17 miles to go the two of us continued on together for about the next ten miles, chatting about ultra running, our families, jobs, you name it. While a lonely runner for the most part, reveling in the solitude of my long runs during the training cycle I surprisingly enjoyed the company and camaraderie on the run. For my partner it was more of a training run for a longer tougher Arizona 100 miler. For me however it was the culmination of my training. As it turned out we had more in common than our love of running and reading list. When I explained that I was running with an ostomy and what brought me to that point, she shared with me the fact that her son dealt with an auto immune disease that had him confined to a wheel chair in his teens and that her mother had crohn’s disease. The comfort level we developed over the course of the next 10 miles made it that much easier for me to say, “hey, I’ll catch up after I empty my bag”. At that moment I would walk a couple of feet off the trail find a low hanging sizeable tree leaf with which to wipe the lip of my pouch upon emptying and proceed. I carried in the back of my pack some hand sanitizer I would apply liberally after each stop and move on. After several more miles of dirt trails and uphill climbs we reached a crossroad literally that diverted the course of a steep climb of asphalt for the next 3-4 miles. 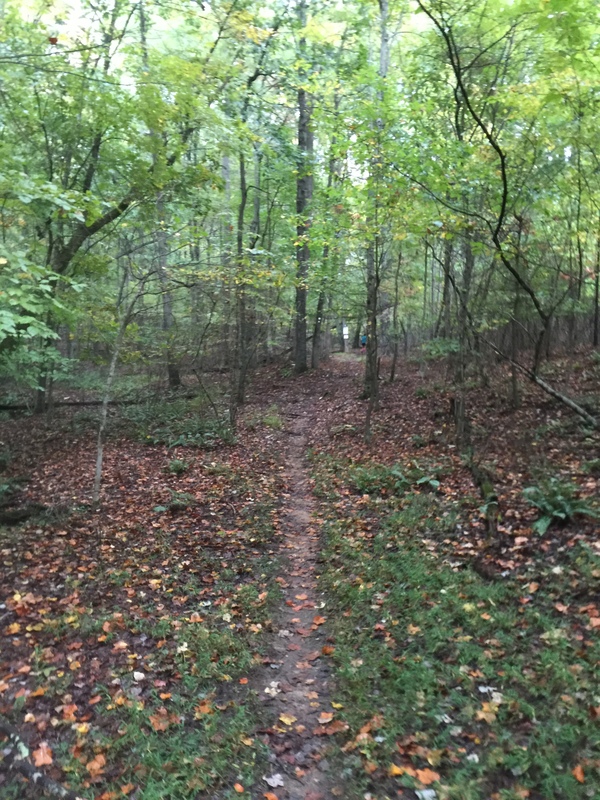 In the weeks leading up to the race it had been announced that a section of the Sauratown Trail was closed and would not be open for the race. Then in the days leading up to the race it was announced that the trail section was open. However the weekend before the race saw Hurricane Joaquin hit the Carolinas. The hurricane caused unprecedented flooding in the Carolina’s, some of which I alluded to in my last post, and apparently re-closed sections of the course. Running along asphalt at this point while welcome by some was extremely painful. 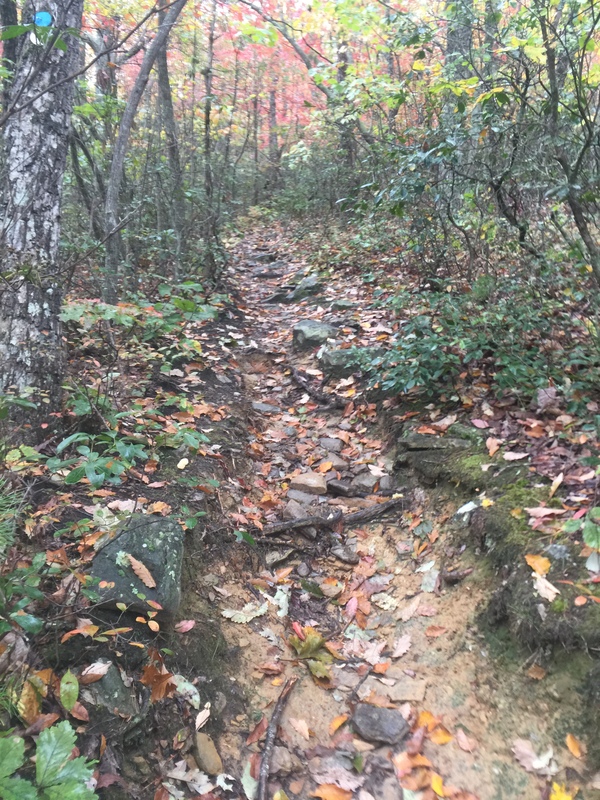 I was ready to get back on dirt right away and the the pain from my leg pounding the asphalt reverberated with every step and thus I slowed to a slow crawl. The asphalt trail seemed to continue not only forever but also at a sixty degree incline until we reached the base of the mountain. Not long after we reached the mountain, around mile 23, facing a precipitous ascent to Hanging Rock that I parted ways with my compatriot. The promise of a mere eight miles to the finish brought hope. That hope was quickly squashed by what I called nature’s stairway to hell. I was unable to scale the mountain with any semblance what one would consider running. It was all hiking for me at this point. It had begun to rain again and the temperatures were dropping as the wind picked up. The trails at this point aside from being steep were littered with rocks, stones, and roots. 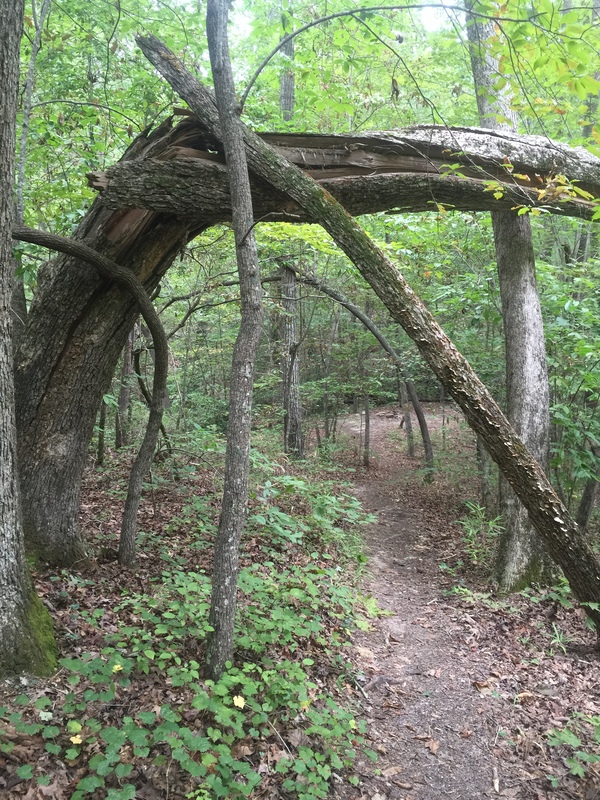 Each time I spied a section of runnable trail I was immediately met by nature’s obstacle course and slowed to a standstill. Women much younger than me fumbling with their earbuds zoomed past me. Only through sheer determination was I able to pass them to inevitably be overcome by those same runners mere seconds later. To most this trail would seem impossible to traverse at a decent clip. Nonetheless there were those that did, leaving with me a deep desire to train and improve upon my ability to navigate “technical” trails. I realized here that long runs of 20 miles or so throughout the neighborhood and adjacent greenway did nothing to prepare me for real trail running. Neither did the groomed trails of the US National Whitewater Center for that matter. I felt like I was crawling on hands and knees as I made my way rather slowly over the treacherous climb to hanging rock. If I look back I believe there were women and children from the Titanic passing me in life rafts up the mountain. I was moving so slowly that I could have sworn that Estelle Getty passed me with a walker along the path and she’s been dead since 2008. With each step I cursed, not thinking as much of the pain in my right leg, though that was always present, but more of the suffering that this race had caused. I swore never again. Why would anyone put themselves through such torture. Yet as I looked around me there was a plethora of sadistic volunteers, some who volunteered willingly or others enlisted by a partner or significant other. What was the attraction I wondered. I had always heard that less than 1% of the U.S. population had completed a marathon. I would imagine that significantly less would complete an ultra, which would put me and anyone else to accomplish those feats in fairly rare company. 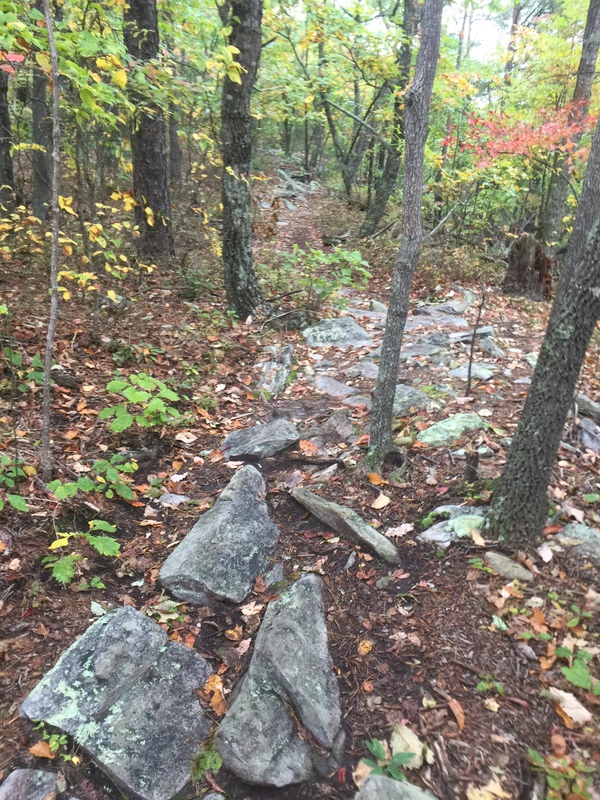 After reaching Hanging Rock the trail began its descent through the start park along more groomed trails and paths, past waterfalls and onto towards the finish line. Once passed the technical trails I was able to pick up my tempo and continue running what seemed at the time to be a decent pace. Of course that was relative I am sure. I felt like I was making up ground quickly. The gatorade provided at the park’s aid station provided a burst of energy. My quickened pace was quickly halted around mile 27. It was there that I entered ultra territory, exceeding the marathon distance of 26.2 and approached the parks waterfalls, the upper and lower cascades. Here was one of the more beautiful and at the same time sadistic sections of a race course I ever witnessed. 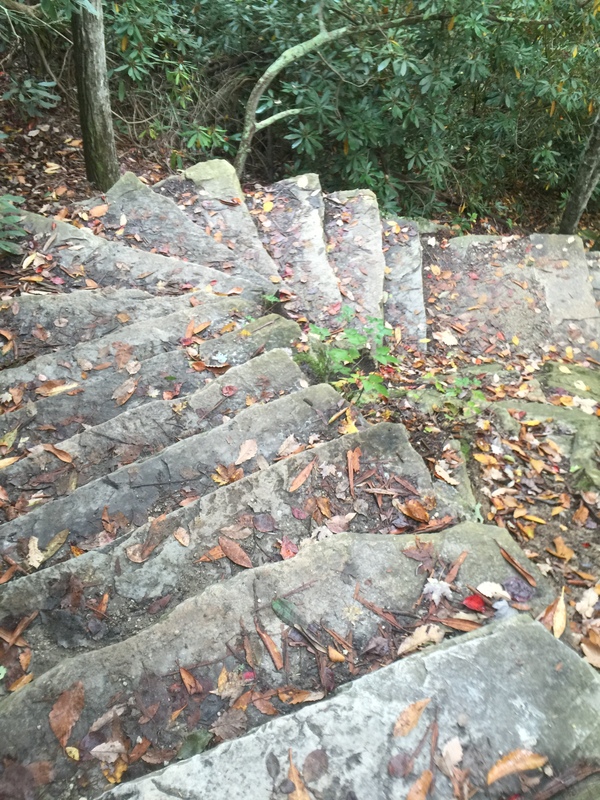 I had already run a marathon, up a mountain, across streams and mud, and now faced a steep stone staircase that descended alongside the waterfalls. Recognizing that no land speed records were being set this day, I paused to take in the beauty of the falls before carefully and gingerly making my down the steps. Steps were murder on the injured calf and I grimaced with each one. The trails around the falls were a bit more congested as the public was out and it made picking up momentum on some of the more groomed single track difficult. A couple of more stream crossing and the signs for Dan River access let me know that the finish was within reach. 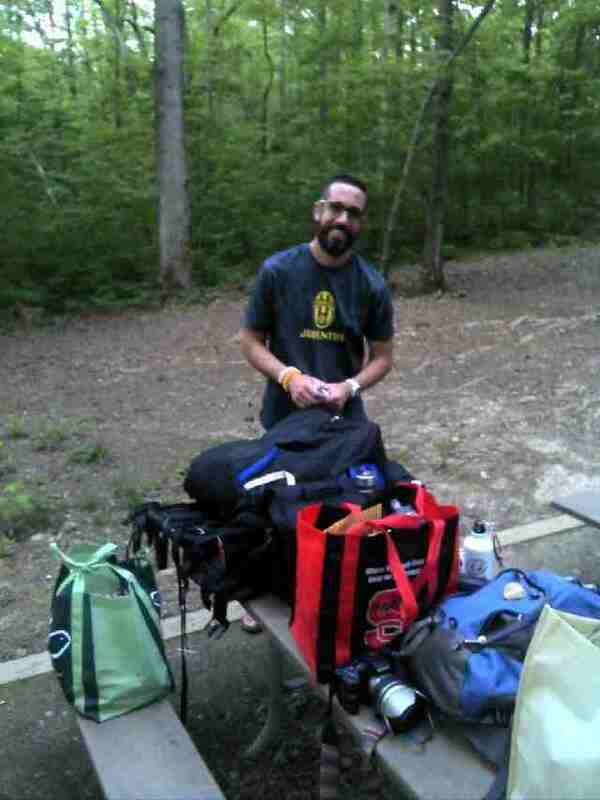 At the final aid station I inquired about the distance to the finish and was told 1.8 miles. It seemed like the longest 1.8 miles I had ever run but before I knew it I had arrived. I picked up the pace once I reached the clearing. I had done it. I had completed my first ultra. It seemed impossible after injuring myself at the onset of the race but it wasn’t. Now I could rest and recover. Race day is tomorrow. While I had a training setback in July and August I recovered in time to tackle my first ultra. I however opted to lower my goal from completing 50 miles for my first time beyond 26.2. While I was able to get my mileage back up after vacation I did not go further than 25 miles in a single run. In the end the thought of doing twice the mileage in a single run and the preparation required in a short time scared me. 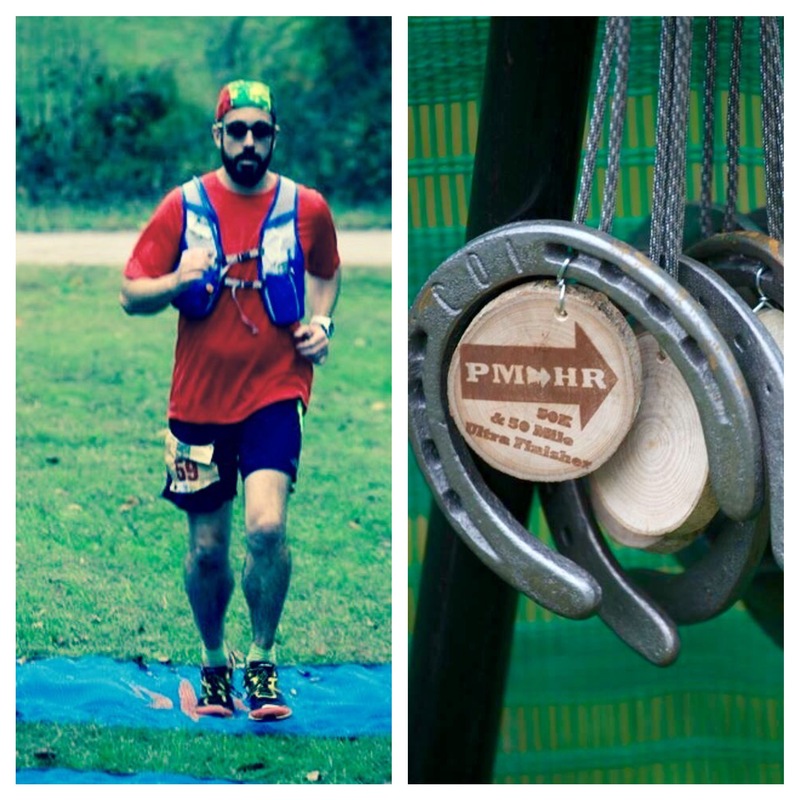 If I am honest with myself, I am afraid of failure and was not certain I could complete the 50 miler. What would be awful is if I am for some reason unable to complete the 50k (31.1 miles) after choosing to step down in distance. I rationalized things a bit with the fact that I after all have only run one full marathon and this was my first attempt beyond that distance. Baby steps I told myself. There will always be tomorrow. The training too requires quite a commitment that not only was my wife getting tired of but I was a little worn out. I will no doubt take a break even if for only a couple of weeks after this race and head to the gym and hit the weights for a change. I continued throughout the training cycle back to back long runs and put in weekly mileage that got near 60 miles for the week. 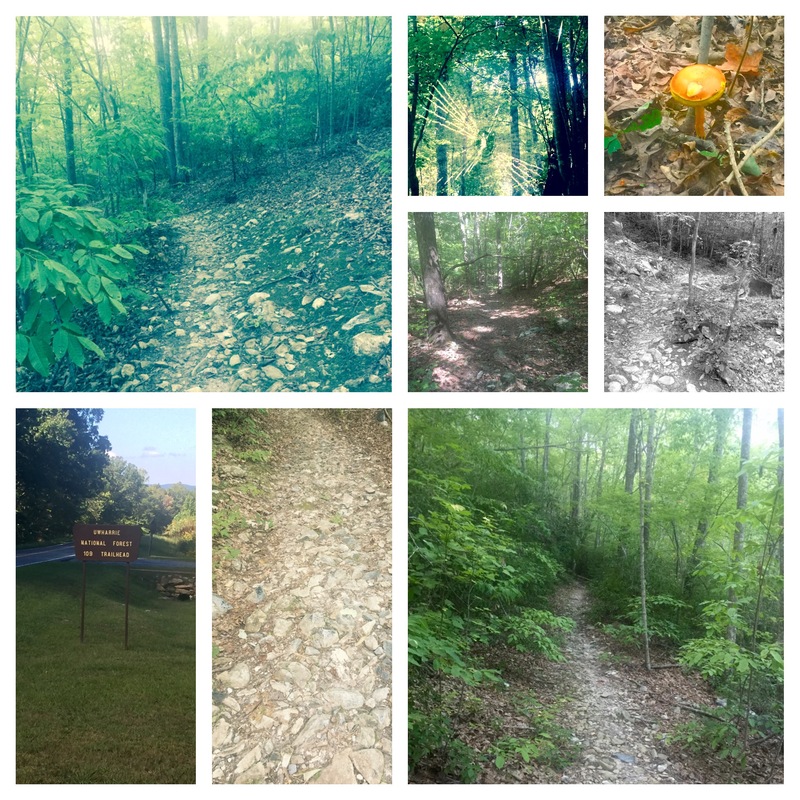 I also changed up my trail runs and tried out the Uwharrie National Forest. 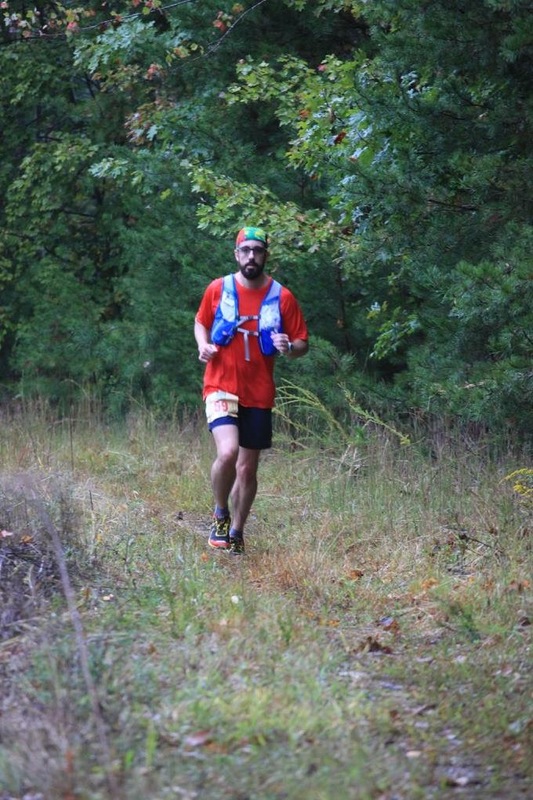 Two consecutive weekends I put in around 20 mile Saturday runs through the forest. 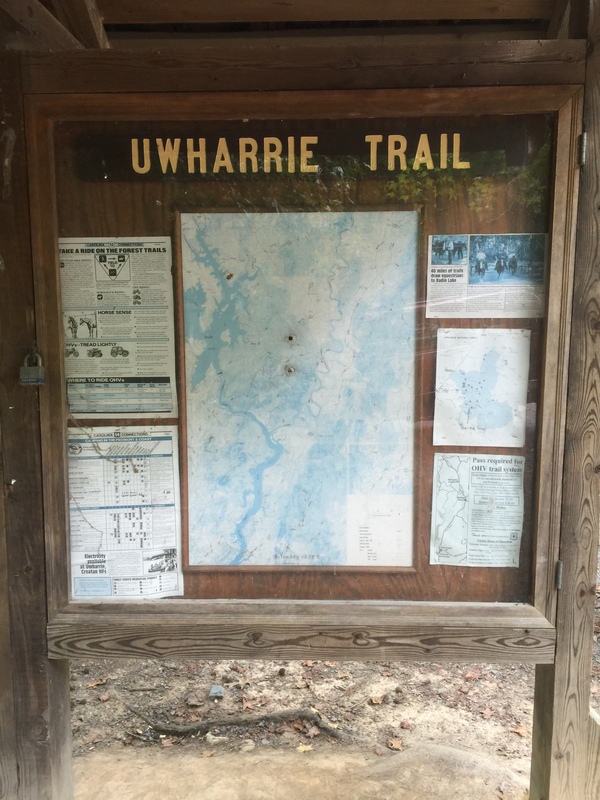 The last of those uwharrie runs due to the treacherous terrain took me nearly 6 hours to complete. 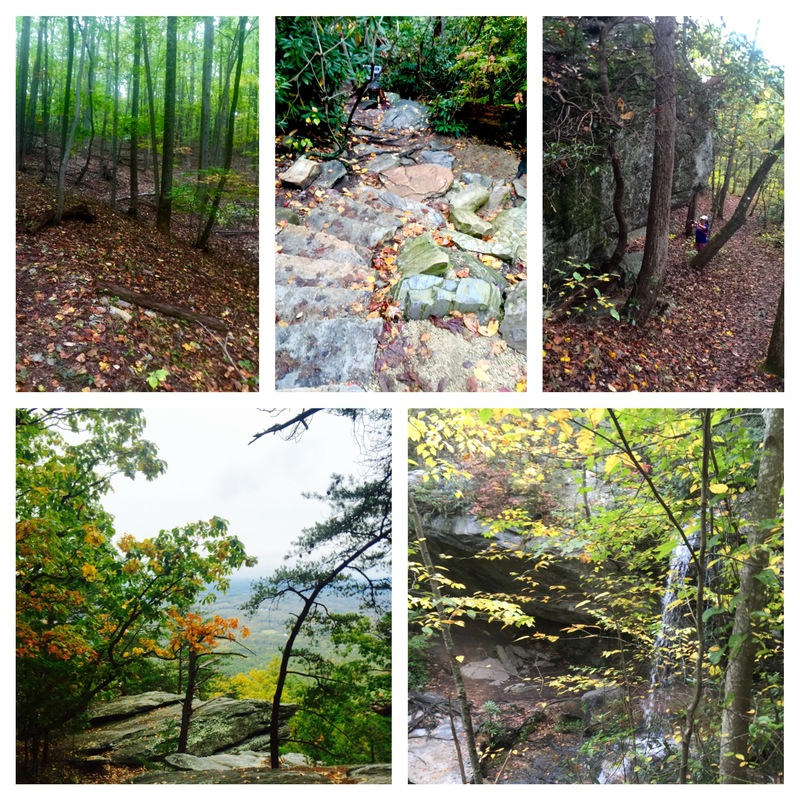 That 6 hour trek was more hiking than running, with fallen trees and rocky terrain. What I took away from it was the 6 hours on my feet moving forward. I prepared for the worst terrain and would be pleasantly surprised by something more groomed and manageable. The streams in the forest were bone dry from the summer drought so water passings presented no challenge. While there was some elevation change in the forest it was more rolling hills and nothing like the 3400 feet of elevation gain I will see tomorrow. Running trails outside my comfort zone of the US National Whitewater Center I did get some questions answered. I had wondered how much running versus walking to do during a mountain ultra and think I have an answer, which is to let the terrain dictate the tempo. We shall see soon enough if that is the correct answer. 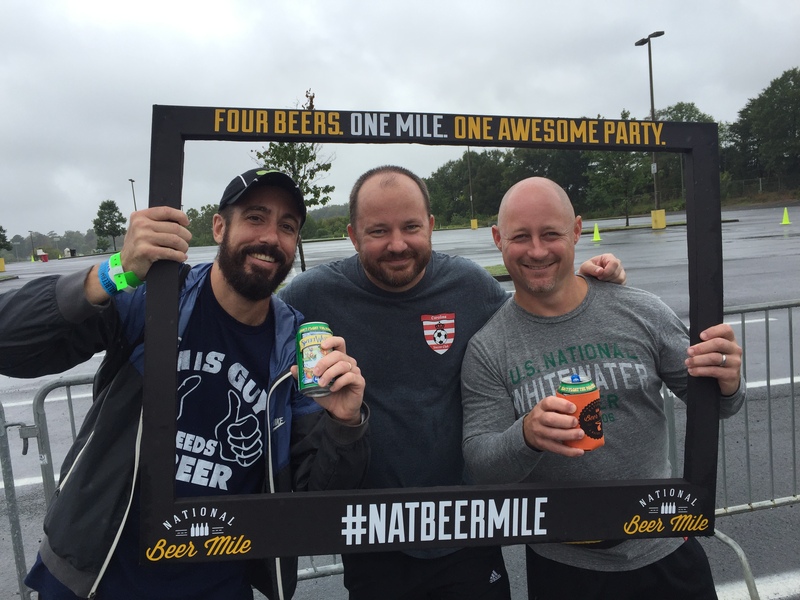 Two weeks from race day I combined my love of beer and running into participation in the national beer mile. The weather was less than ideal that day but it did not dampen our spirits. 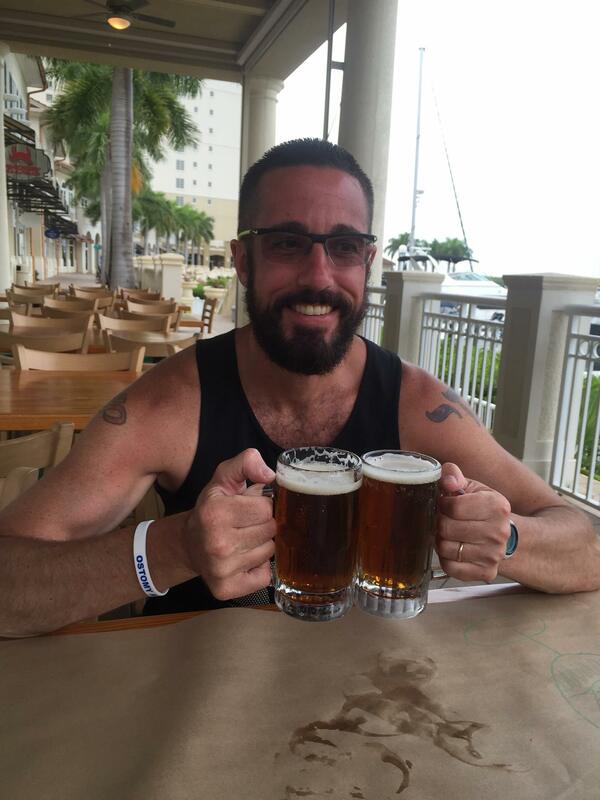 I was psyched to run and drink beer at the same time. I was delusional in my time expectations shooting for something comfortable like 8 to 9 minutes. I forgot that chugging beer was a prerequisite. I hadn’t chugged a beer since college and never had I chugged 4 beers consecutively, let alone tried to mix in running in between. A few days earlier it had been announced that the the beer would be supplied by Sweetwater and New Belgium. That news was more than welcomed as I would not have to drink the dreaded Budweiser but instead something I enjoyed. While I love IPAs I would not try to chug the beer with a higher alcohol content and instead chose to go with Sweetwater 420, an American Pale Ale. The first beer went down rather easy as soon as I took off at a comfortable pace I began to burp. In the back of my mind I prayed it was just burps from the carbonation and nothing more. Despite the rain I began to sweat too. In the second beer station I polished off my second can, however it was slower going down. Nonetheless I emptied it and took off. Only this time during the 2nd 400 meters my mouth began to water and the burps continued. This was not a good sign. I quickly gave up on any time goal and settled in on the goal of not vomiting. My buddies and I had slowed to a trot, spending more time in each beer station along the way. By the third beer station my chugging had turned to sipping and I was not able to finish but two thirds of the can before chucking it. It was on that third leg that we noticed a fellow contestant hands on his knees hurling along the course and then seconds later was sprinting again. At the final aid station I was able to get down only half a beer before completing the mile in nearly 17 minutes, a personal beer mile best. Once the race was over I was better able to pace myself, drinking beer of course. The beer mile was great preparation for the ultra as it tested my endurance. I dealt with inclement weather and pacing issues. It was a lot of fun and can’t wait to do it again. Though the next time I will have to train harder. I have new found respect for beer milers as athletes. As set off to leave for the race the forecast is for cooler temperatures and rain. What is unfortunate is the rain follows last week’s hurricane rains and flash flooding throughout the states of North and South Carolina. It promises to have the makings of a mudfest. 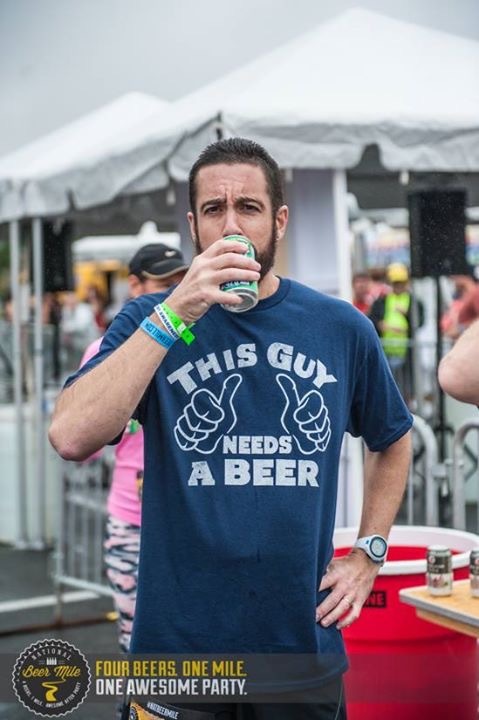 But they race organizers promise a beer at the end. It has been a while between posts. In the beginning I had hoped to be able to blog about my training regimen and progress on a more regular basis. Unfortunately a little thing called life seemed to get in the way and nearly derail my training. Towards the end of June through the first couple of phases of my training cycle I had remained on point and progressed up to 50 miles a week with back to back long runs of 20 and 10 miles. 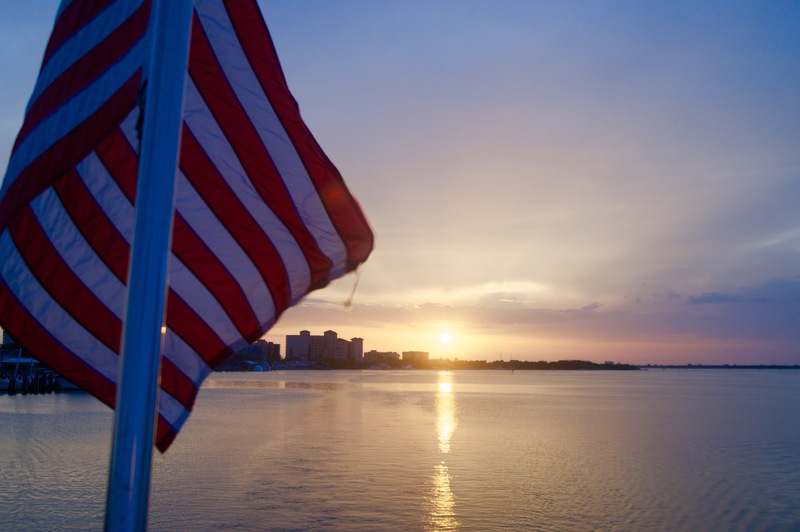 Everything was going as planned and then July 2nd the family packed into the car and drove over two days to southwest Florida for summer vacation. 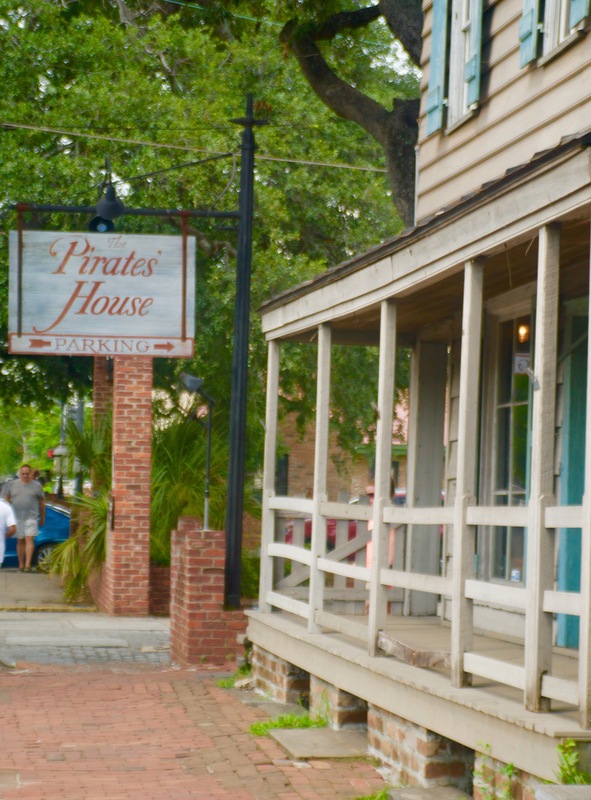 Drive time, sight seeing stops, family fun, happy hours, pool time, the beach, waterparks, parasailing, and pirate cruises all wreaked havoc on my training. I did not skip running completely. I logged 4 runs during the week. However none longer than 10 miles. The 10 mile run was a heat training session conducted in the nearly triple digit temperatures and ninety percent humidity of southern Florida in July. While not quite Badwater, tropical runs in the peak of summer are not enjoyable. By the end of the run my appliance had nearly come off. Cooling down after the run and a cold shower was nearly impossible too, which made putting on a new flange very challenging. We returned from Florida late on a Saturday night after a full day of sightseeing in Savannah, Georgia. Thoroughly exhausted I eeked out a tiring 6 miles the following day. Just a week and a half later my son and I were flying cross country to California where my wife was on a project with work. Her travel enabled the family to tag along and take our son his second memorable vacation of the summer. The impetus behind the decision to do this was the proximity to Disneyland, something that Richie at five years of age was more than ready for. 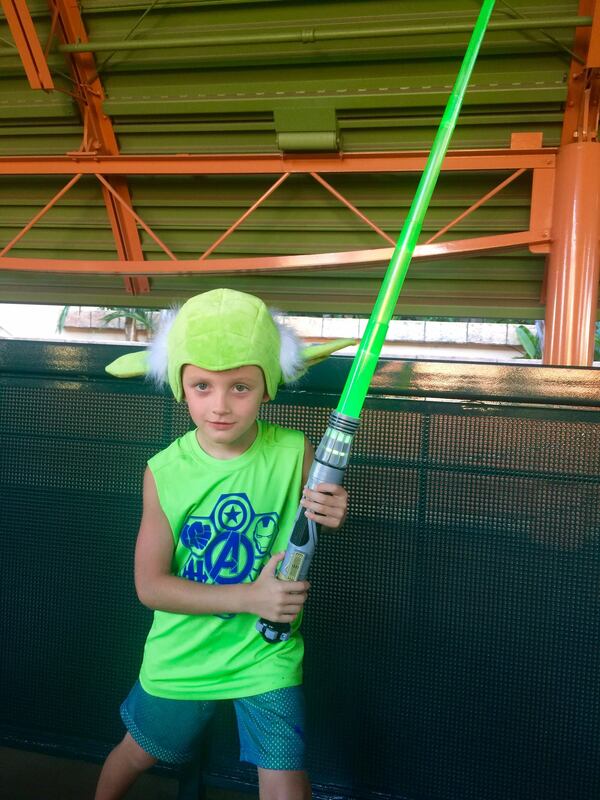 I would argue that at five he was the ideal age for a trip to Disneyland. While I packed some running shoes and clothes for the trip they did not come out. Flying cross country with a five year old does not lend itself to relaxation at any point, particularly on an airplane. We arrived at LAX on a Thursday night at around 9:30 locally or 12:30 am eastern. Richie was wired and up bright and early Friday morning, ready to take in all that hotel living has to offer a 5 year old. Waking up in a very swank Los Angeles Marriott property with pools, jacuzzi, upscale breakfast buffet with skyline view of southern California is enough to get me out of bed to say nothing of a rising kindergartner. After dropping mommy off at work and getting in some pool time we were headed to downtown LA and the La Brea tar pits on our first day in California. A full day in Los Angeles and evening out with mom afterwards was followed by 2 consecutive magical days at Disneyland and Disneyland California Adventure. Both Saturday and Sunday saw us up and out and headed to the park before 8 am, wrapping up each day with fireworks and light shows around 10 pm. Saturday evening’s fireworks in addition to providing the perfect finish to a magical day also provided some ostomy drama. We grabbed are tickets for the show early in the afternoon and had a great viewing area right around the lake. Richie watched from my lap leaning back against me. As we got up after the show ended I discovered that my appliance had burst. I thought Richie had simply farted during the show. Frustrated and upset it made for a long uncomfortable walk through the crowds to the bus lines at the entrance to the park. It could have been much worse. Fortunately a kind bus driver obtained his supervisors permission to take us back to our hotel then so we did not have to wait an hour for our designated bus. I am sure we looked like a sad lot, mom exhausted with her son asleep on her lap clenching his lightsaber and me with leaking poop and a depressed look on my face. The bus driver was our savior that night. Legoland was also on the agenda but come Sunday afternoon I had pushed it back to Tuesday. I needed Monday to recover. 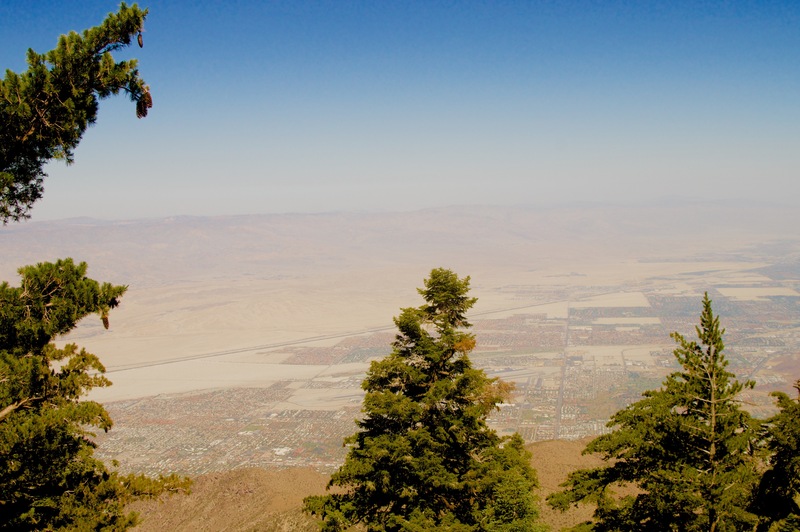 So Richie and I after taking Mom to work headed to Palm Springs, California and took the aerial tram up to the San Jacinto mountain where we hiked and explored at an elevation of around 10,000 feet. 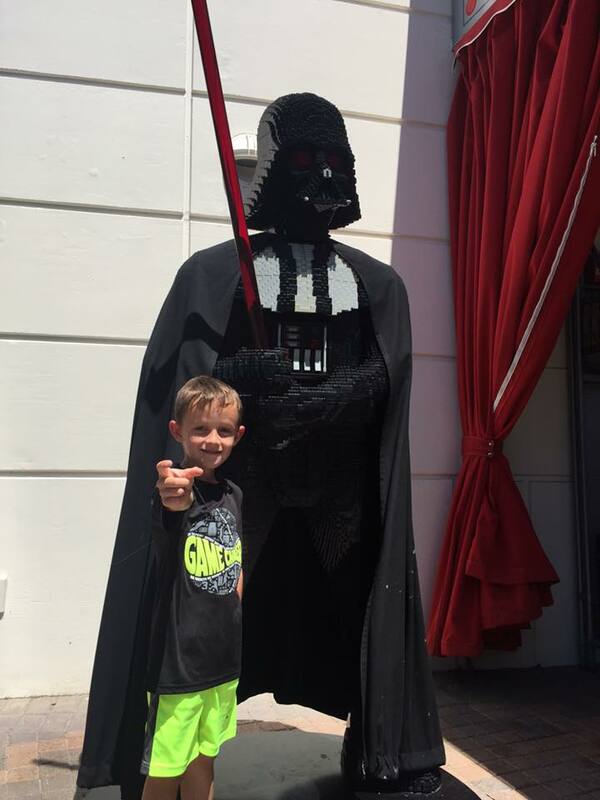 The next day, our last in California was a father and son trip to Carlsbad, California and Legoland. Richie had a blast despite admitting it wasn’t as great as Disneyland. The rides were much tamer and made for smaller less adventurous children. The lengths that Disney goes to create a magical experience from the moment you enter the park, were absent from Legoland. Still, we closed the park down. By the time we arrived back at our hotel in Corona it was eleven o’clock at night. The alarm was set for 4 am the following morning in order to make our 6 am flight on the first leg of our trip home. A business class flight home was enough to keep Richie wired the entire trip. When we landed in Charlotte I joined the ranks of the walking dead only to find that my luggage had not made it with us. I was exhausted from the pure lack of sleep and non stop schedule. The jet lag really took its toll this trip, more than any other time I can remember. The next two days at work my head was in a fog. I didn’t even attempt to run, out of sheer exhaustion. With a jam packed schedule of traveling, sight seeing, and amusement parks I had not run in nearly a week and desperately wanted to but physically could not. When Saturday rolled around I assumed I had recovered. I discovered early into my run that I had not. I was not winded nor was I sore. I slogged approximately 7 miles, only making it two before mixing in some walking. I was dejected. I felt as if I had forgotten how to run. My ability to run long distances had seemingly been sucked from my body, like a scene from the movie space jam. Determined to prove that Saturday’s run was an anomaly I went right back out on Sunday only to experience more of the same. Disheartened I took the next five days off from running, shrugging off the experience as a result of exhaustion, burnout, or overtraining symptoms. I still went to the gym, lifted weights, and did light cardio over the next few days. The next weekend, my second since returning from California I attempted to lace up the shoes once again. This time I ran a full 14 miles, a marked improvement, followed by 6 the next day. After the recent setback I decided to change up my training schedule from the one I started out with. Instead of pushing through 5 long runs a week I decided to change things up. Tuesday has now become fartlek day, where I do 4-6 miles of fartleks through the greenway in our neighborhood. Wednesdays, instead of doing 10-12 long slow miles are now dedicated to weightlifting and cross training. Thursdays, with the need for some speed hiking and climbing, I now spend on the treadmill with a 10 percent incline at a 4.5 mile per hour pace and go for two hours. Friday is weight lifting and yoga in the morning and early to bed so I can get up at 3 am to beat the heat and knock out the really long runs. My first full week under this new self designed regimen and I logged 22 miles on Saturday followed by 8 on Sunday. This, just two weeks after forgetting how to run. Changing up the training plan less than two months to the race may be a recipe for disaster. I shall see. I do feel a little fresher and certainly am pleased with the quick turnaround after losing my ability to run. I hope mixing things up wil keep me fresher and stronger both physically and mentally. With the big day quickly approaching however I am beginning to doubt my ability to finish 50 miles. Admittedly I have gotten stronger year over year. When training for my first marathon a year ago, I could barely walk the week after finishing 26.2. Now I complete 22 and go out and run 8 more the next day. After that second long run I feel better than I did before I began it. However 22 miles isn’t even half way to 50. Perhaps a 50k, which was the original idea when I set out to tackle an ultra was the best idea. I talked myself into going big. Maybe too big for starters? The majority of my training for the mountain ultra has been off the trail and on roads with relatively little to no elevation profile. 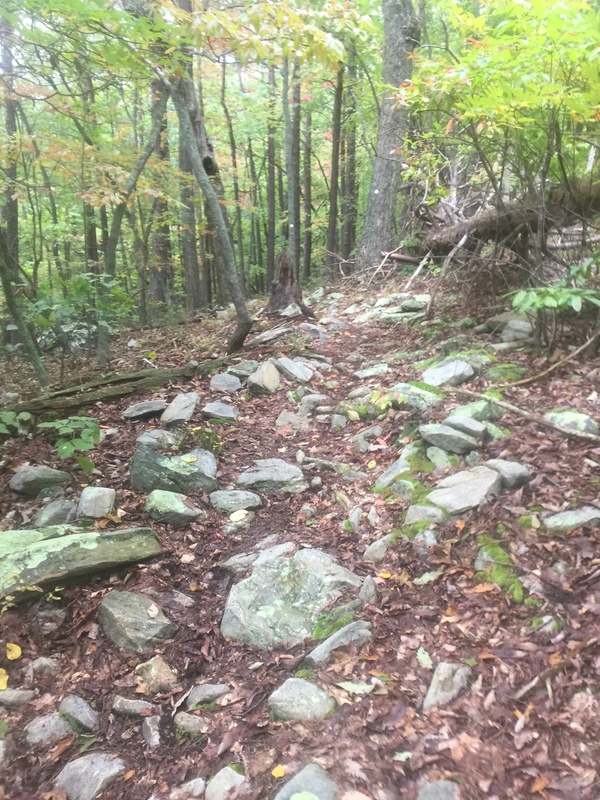 The race however will take place on technical trails with 3400 feet of elevation gain for the 50k and 5600 feet of gain for the 50 miler. As strong as I have gotten a voice inside of me tells me I am woefully unprepared. I’ve decided to give myself some time to see how the next few weeks go with the new regimen before making the decision to go down in distance. In addition to rethinking the race distance I am also having second thoughts on the decision to rough it in a tent. The further I run in my training and closer I get to race day the more I begin to value air conditioning, a shower, and bed. I don’t ask for much, well maybe a beer too would be nice! Week 4 of my ultra training plan called for a significant increasing in weekend mileage. Never in my wildest dreams would I have thought of running 10 miles immediately following a 20 mile run the day before. However that is exactly what I did this Fathers Day Sunday. With the temperatures rising above 100 this week, I was determined to get to bed early on Friday to wake at 3 am and knock out the longest of the two runs under the cover of darkness, or at least for a good portion of the run. While I did not cramp, nor was I winded, the run became painful by mile 17, so I pretty much walked the final three miles. Getting up at 3 am to set out for a run was not without its benefits. My favorite part of the run was running along the greenway trail in the neighborhood between 4 and 5 am and witnessing nature’s fireworks display provided by the fireflies. It was a beautiful sight. I’ll pull out the phone for pictures the next time. Saturday was also the second time in as many weeks that I practiced fueling during the run. In addition to the brown rice cakes and nutter butter I tried the Power Bar Energy Wafer, which can be found at Walmart and are rather inexpensive. I found they rather agreed with me. It did not lead to excessive output and its taste and texture were agreeable. On the flip side, while I enjoy the saltiness and carbs of the rice cakes they can be dry particularly when parched in the heat. If a kernel gets stuck in the back of your throat, you can, as I found out, wind up coughing for miles. I also used the 20 mile run on Saturday to try the first of the samples that I received from Skratch Labs. I was particularly eager to try the samples, as to this point the only other skratch labs product that I tried was the exercise hydration mix with matcha and lemons. After listening to a Natural Running Network interview with Dr. Lim I decided to inquire about the rescue and hyper products believing they may be more suitable to an endurance ostomate. The directions on the lemon and lime flavored individual packets suggested mixing with 16 ounces of water. With a nearly full 72 ounce camelbak reservoir I mixed four packets of the rescue hydration mix. While I realize that not everything good for us tastes great I was a little disappointed. The taste of the rescue hydration mix tasted a bit like sucking on a lemon or drinking a virgin margarita. In either case it wasn’t the best. When something doesn’t taste great it is increasing difficult to consume it as frequently as one should. At least that is my theory. The other theory is, and I have discovered this with some of the hydration mixes is finding the right balance of electrolytes while also quenching thirst. Too much sodium and potassium bicarbonate seem to make me thirstier and while the bite valve provides temporary relief it does not provide the same type of thirst quenching ability as plain old H2O. Perhaps the key is to balance the electrolyte mix in the camelbak bladder with good old water. I typically buy the high alkaline water from Trader Joes. At 750 mg of sodium and 250 mg of potassium per serving, for a a 72 ounce camelbak bladder I got 3000 mg of sodium and 1000 mg of potassium from the rescue mix. Compare that to tailwind at roughly 300 mg per 8 oz of water and 88 mg of potassium per 8 oz of water. Skratch provides three times the sodium, something that minus a colon, my body does not absorb well and nearly 75 mg more potassium per serving. Both the rescue hydration mix from skratch labs and tailwind provide the essential electrolytes my body craves during long hot runs. I can actually taste and feel the effect. However they do not completely resolve the issue of thirst during the run. Barely rested, on Sunday, Fathers Day, I set out early (not 3 am early) to run another 10 miles. Originally I had planned to do this one on the trails. Given the 30 minute drive to the US Whitewater Center where most of my trail mileage is logged and the fact it was fathers day, I opted to stay close to home and relax afterwards. I am glad I did. Still sore from Saturday’s run I felt more comfortable as the run progressed. Instead of the rescue hydration skratch I mixed three single serve packets of the hyper hydration mix. I wanted to try the hyper for comparison. Since I was venturing out after the sun had already risen and temperatures had consistently reached 100 for two weeks now, it may be the perfect time to give it a shot. I diluted the mix a bit only mixing 3 packets to 72 ounces of water, wary of the sodium content. I was hopeful that the mango flavor would make it more tolerable too. At 1700 mg of sodium per packet and 80 mg of potassium, there was significantly more sodium and substantially less potassium for my day 2 run. The 3 hyper hydration packets provided a whopping 5100 mg of sodium in my bladder and 240 mg of potassium. I found the taste even with the increased sodium more agreeable than the lemon sucking rescue hydration mix. What I am not certain of is why the reduced amounts of potassium with the increased amounts of sodium. I don’t know enough about the science behind it but would think there should be a proportionate amount of essential minerals in the body and subsequently need to be in a hydration drink. There are plenty of articles on the internet about the importance of electrolytes for ostomates. Unfortunately there are not many that touch upon the subject of endurance sport ostomates. In order to truly compare the rescue and hyper mixes I need to give the hyper hydration a shot during my 20 mile run and the rescue hydration a try during the 10 mile run. This weekend should present the perfect opportunity to do so. By the end of the hot and humid run Sunday I was spent. I had some aches and soreness in my calf and hips, places that have not hurt for a while. After some breakfast and coffee it was out to the pool with my son for father’s day because I did not really want to venture further than the community pool that day. This weekend marked my first ever double digit mileage training runs in back to back days. I felt like I had the onset of achilles tendonitis as well as some major hip soreness that might lead to something else. It is so early in the training plan that I do not want to risk doing anything that can keep me out for an extended period of time. After a rest day on Monday it was the bike an elliptical on Tuesday and Wednesday. By Thursday my legs felt better, even more so after logging 6 miles at 5 am. I briefly entertained the idea of doing a Friday night longer run followed by a Saturday morning long run in order to get ahead of the forecast rains. However the more I think about it, with temps being what they have been I could use the rain and cooler temperatures. This weekend will be another high mileage weekend and then I get to take it down a bit for the recovery week, which coincides perfectly with a family trip to Florida and the 4th of July holiday. I am at the end of week 3 of my 50 mile training plan (found here: http://www.trailrunevents.com/ul/schedule-50m.asp). It was a light week and a bit welcome after an 18 mile run (17 actually completed) followed by a weekend of hiking, camping, and sherpa duty with two other fathers and our five year old boys. 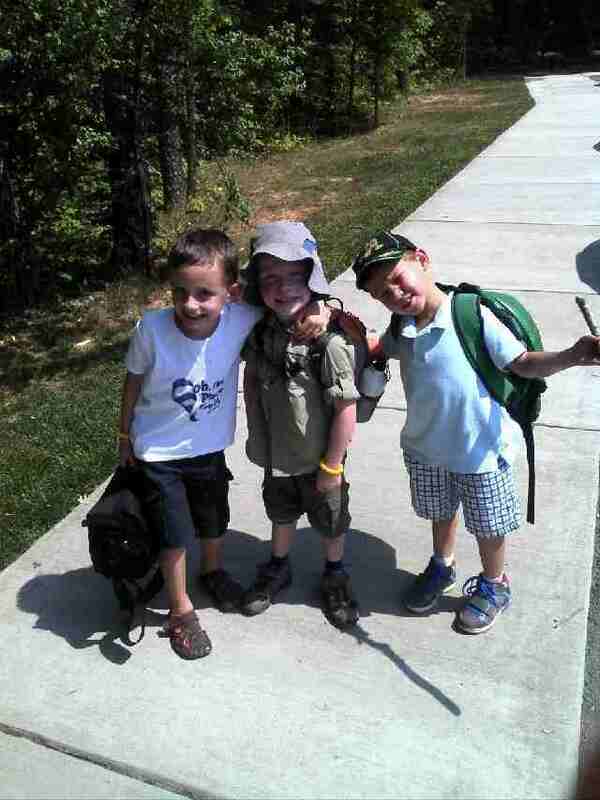 The camping trip with five year olds was an endurance even in and of itself. The steadfast rules to date, many of which began prior to the onset of the training plan are no alcohol before long runs and a low fiber diet the night before. Following up my blog entry on control I sucked it up, and as planned began experimenting with eating during the run. While certainly fatigued at the end of a 3 hour training run I recovered rather quickly. I attribute that fact to the rice cakes and nutter butter consumed during the run. Two and a half 6 mile loops through our very large neighborhood were a great training course. I could duck into the house quickly to use the bathroom if the bag was getting full and keep on going. The proximity of bathroom facilities took the fear factor out of the equation. I was also able to rehydrate easily as well, leaving a pre-filled water flask to grab on the way back out. And added training benefit was the psychological factor. When training endurance event certain to challenge your mental faculties it is difficult to attempt to create the same types of mental challenges you will face after 10 hours on your feet. However, running like a gerbil on a treadmill through my own neighborhood for hours might come close. There is a reason my first ultra of choice is a point to point rather than a loop course. Thus, running loops around my neighborhood seems the perfect way to test my sanity and practice nutrition. While I am comfortable emptying the ostomy bag into nearby bushes and wiping with a leaf, I do tend to get a little stage fright with the potential for passersby. 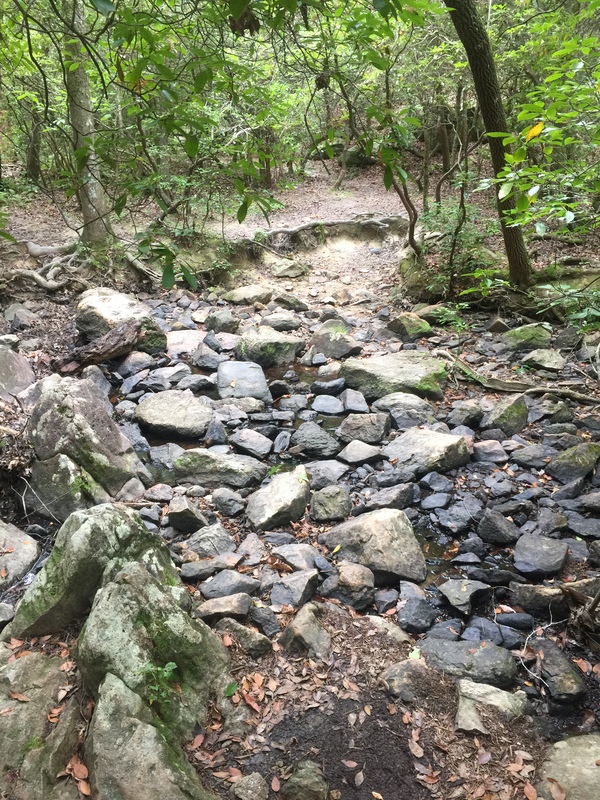 Thus the well populated trails of the US National Whitewater Center or some of the state parks in the area aren’t the most ideal to experiment with nutrition and frequent pouch emptying. As I write I am toying with the idea of running my Saturday long runs around the neighborhood for the aforementioned reason of sanity testing and nutrition experimentation. I can then use the shorter Sunday runs for trail training. After that, being able to sleep past 5 am on a Monday will be very welcomed. My take away from my first run with a focus on nutrition is that nutter butters for the most part agree. The brown rice cakes are rather agreeable too. The thin cracker like square rice cakes are perfect for the front pocket of my camelbak vest. Chase it down with some tailwind or skratch and I am good to go. Next week I plan to experiment with some power bar protein waffles. Mud Energy has already received the “ostomyontherun” stamp of approval. Unfortunately it is not readily available in my area and rather expensive. As far as gels go I am considering experimenting with some clif gels and in particular the new pizza flavored gel recently introduced. 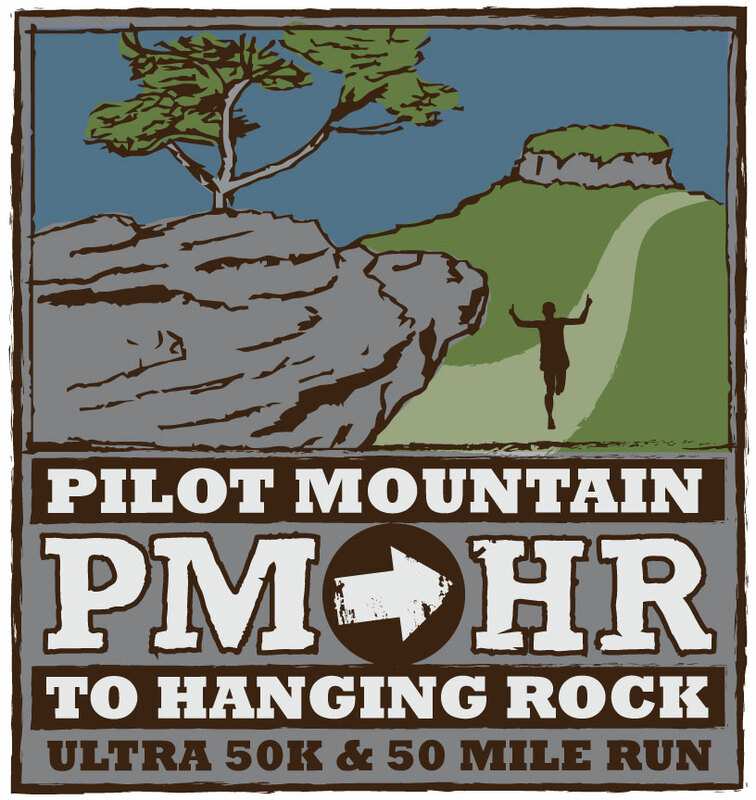 This week I officially registered for the Pilot Mountain to Hanging Rock 50 mile ultra on October 10th. There is no turning back now. I had to play the father’s day card to get my wife to acquiesce. Whatever it takes (Maybe that is my new running matra). The next detail to work out in advance of October 10th is lodging. Part of me says, hey, I’m in the mountains, so go camping and be one with nature. Another part of me says that I will be roughing it for 12 hours on my feet, why do I have to punish my body by sleeping on the ground too. The idea of camping near the end of the race where the after party is held at a music venue and taproom on the Dan River is appealing. Falling asleep that night in a tent to stars, fresh air, and crickets seems awfully refreshing. I may have rediscovered the camping bug last weekend much to my surprise. So much so that I downloaded the audiobook “A Walk in the Woods” by Bill Bryson to take with me on my run to this morning. So far, through 4 chapters, a great read…uh listen. Finally, this week I reached out to two of my favorite companies, skratch labs and altra running. While I scored some goods from both I like to think they gained an ambassador and thus I mention them in this blog post. With Skratch labs, I listened to a recent interview on the Natural Running Network with Dr. Lim and couldn’t help but wonder whether I was using the wrong product. To date the only thing I have tried aside from Tailwind is the Match Lemon hydration mix with natural caffeine derived from tea. I am excited to be getting samples of the rescue and hyper. Given the particularly challenging part of being both an endurance athlete and ostomate, I believe my weighing in on the product will be particularly important. I am also eager to see if the other products are better able to fuel me for an ultra marathon. As for Altra, it is the only shoe I wear and while I tend to be rather minimalist in my shoe preferences the challenge of some extra long runs and desire for foot relief has me contemplating the purchase of some more cushioned shoes such as the olympus. We shall see. Next week sees a modest increase in mid week miles, while my Saturday run extends to 20 miles followed by 8 on Sunday. Oh My!!!! I am a father, a husband, a runner, and a photographer. I am a registered investment advisor and love my job and company. For the past 10 years I have had to battle ulcerative colitis, various drug treatments, surgeries, and all kinds of complications. My disease and now life with an ostomy have come to define me in many ways. This blog is my first step in an attempt to reclaim my life. It is my hope that by maintaining a journal of my daily struggles and accomplishments and sharing it with the world not only can I help myself but help others that may be facing similar issues as well. Runner Academy All around great running podcast with lots of great tips and information for every level of runner. Tailwind Nutrition An essential product for any ostomate into distance running. Its the only thing that goes in my bladder. Trail Runner Nation Podcast A useful podcast with ultra runners as the target audience with lots of great interviews and tips on training and nutrition. Hard runs. Healthy eating. Happy life.